Dr. Charles R. Mojock, fifth President of Lake-Sumter State College, has served in the position since July 1, 2002. He came to LSSC from Daytona Beach Community College where he was employed for 23 years, starting on the faculty and advancing to Senior Vice President for Planning and Institutional Advancement. He holds a Bachelor of Arts degree from St. Mary’s Seminary and University (Baltimore, Maryland), a Master of Arts degree from Stetson University (Deland, FL) and a Doctor of Education degree from the University of Central Florida (Orlando). Dr. Mojock is heavily involved in the community and he received the Lake County Community Service Award for 2006-07. 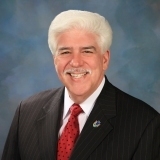 He has served on the Board of organizations such as the Metro Orlando Economic Development Council, Florida High Tech Corridor Council, United Way of Lake & Sumter Counties, LifeStream Behavioral Center, March of Dimes, Leadership Lake, Workforce Central Florida, Lake County Shared Services Network, Kids Central and South Lake Chamber, Boy Scouts, Golden Eagle Honoree and Lake County Chamber Alliance – Economic Advisory Committee. Dr. Mojock serves on the AFC (Association of Florida Colleges) Foundation Board of Directors. He also serves as a member of the Board of Trustees of SACS Commission on Colleges. He is Past President of the Southern Association of Junior, Technical and Community Colleges (SAJTC) and he served as the Chair of the Florida College of Presidents for 2007-08. He enjoys sports, reading, and family activities. Dr. Mojock and his wife, Cathy, reside in Mount Dora. They have three sons; Christopher, and his wife, Suzi, and three granddaughters who reside in Georgia, where Chris is a professor at the University of Georgia in Athens; Matthew, who works and attends Florida State University part-time, and Jon, and his wife Theresa, and their son and daughter, who work in the Fitness Industry and reside in Colorado.